Let's say your magazine site sells subscriptions, and you want to allow users to make payments periodically , but you don't want to bother them to come back to your site and fill out the form each month. Or, let's assume you run a charity site, and you need recurring payments from donors. For example, on a Charity site scenario, you can set up a recurring donation in your form using any of the Payment tools, (except ClickBank and OneBip). 1. Click the ADD FORM ELEMENT button, go to the PAYMENTS tab, and click the Payment Processor you wish to use (e.g. PayPal). 2. 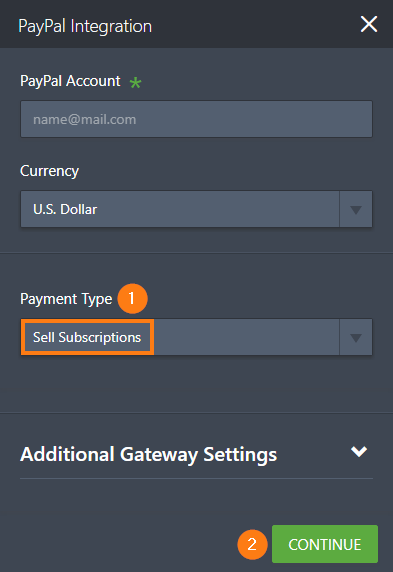 Configure your credentials then on the PAYMENT TYPE section, select SELL SUBSCRIPTIONS. Click the CONTINUE button to proceed. 3. Click the CREATE NEW SUBSCRIPTION button. 3. You can then configure the details of the subscription like the price, subscription period, number of payments, etc. NAME - You can always customize the label. You can choose whatever you need. Let's say, Monthly Donations. PRICE - The price of the subscription. Decimal is allowed. SUBSCRIPTION PERIOD - The period when the recurring payments will happen. You are allowed to set it to daily, weekly, bi-weekly, monthly, bi-monthly, quarterly, semi-yearly, yearly and bi-yearly. NUMBER OF PAYMENTS - Set this if you want to stop charging customers after a certain number of payments. Let's say, you charge your customer five (5) times and automatically stop it on the six (6th) time, select five (5) from the dropdown selections. You have the option to allow user to select the number of payments, select USER-SELECTED to do so. IMAGE - If you want to show an image for the subscription item. 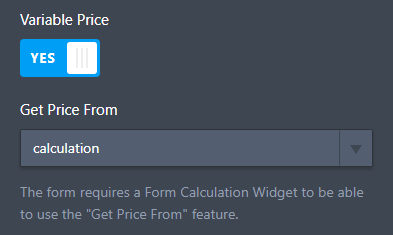 VARIABLE PRICE - Make the price changeable via user input or referencing a Form Calculation Widget. Note that when this option is enabled, the TRIAL PERIOD option is automatically disabled. Notice that Subscription # 2 (Variable Price) changes depending on the selection on the Dropdown Fields. SET CUSTOM FIRST PAYMENT COST - If you want to charge your customer a bigger amount from the original as their first payment. Usually, this applies for setup fees. The amount should not be less than the original price. TRIAL PERIOD - If you want to set a trial period for your customers. Trial period options are: One day, three days, five days, one week, two weeks, 10 days, 15 days, 30 days, 60 days, 90 days, six months and one year. SELECTED BY DEFAULT - If you have multiple options and would like to select an item as the default selected subscription. NOTE - Please note that some of the above options may or may not available in the payment wizard and they depend on the payment gateway being used. I will have monthly subscriptions on my site. 1. What happens if the user unsubscribes or stops paying? 2. How do I go about closing an account if #1 happens? Hi, I"m trying to set up a subscription using square, however there isn't an option to select number of payments. Please help. Would we be able to achieve this objective with your pluggin on our word press? Hi, I"m trying to set up a subscription using stripe, however there isn't an option to select number of payments. Please help. I'm seeking a Direct deposit form ! I cant even get the paypal widget to work in the UK, is this only available in the US version? Can i set a starting date for the subscription, so i can charge my costumers all at the same time? For example, i'm using a quarterly subscription payment. Can i set starting date in Sept 1st, so the card will get charge automatically on Dec 1st, March 1st and June 1st??? We have come to this: We have used Stripe VERY NICELY with jotform for subscription sales. Everything works quite nicely. HOWEVER, recently we have had an inquiry by management about moving away our subscriptions from under the house of Stripe back-end to Zoho Subscriptions and Zoho Invoice cloud (still using stripe possibly as the gateway, but the actual subscription and auto-charging is handled by Zoho back-end) and we were wondering if Jotform has a ready to use integration with Zoho Subscriptions/Invoice the way it has with payment gateways themselves. I currently have a product that is free for 2 years, and subsequently pay on a yearly subscription fee. May I know is there a way to go about doing that? I'm using Stripe, the NUMBER OF PAYMENTS option is not visible. Please help! Does this work with WorldPay? We don't see this as an option. Is there a way to add that one item that requires recurring payments to our current product form ? We have created a product form (which works fine ) that is linked to our website that has multiple products using PayPal as a payment gateway, however, one of the products requires a subscription so we can collect a monthly recurring payment on it, but we're not quite sure how to add the subscription form along with the product form. Please help? How do I limit the payments in version 4 or how do I create the form in version 3? Thank you for your response! I do have another questions. We want the capability to use card swipers as well as setting up recurring payments. Any suggestions? Apparently, the integration with Square is not working properly? The whole reason who chose Square was it's compatibility with jot form for recurring payments. Any suggestions? Other payment processors that are working well for people? We are set up with Square and Jot Form and want to take recurring payments. However, when setting up forms we do not have the payment option to "sell subscriptions". How would my subscribers change/upgrade/downgrade their subscription? For example, how would a customer upgrade from a monthly subscription to an annual subscription option? Is there a way to set up an option for the donor to select whether this will be a one time gift OR recurring (and they can select whether it is weekly, bi-weekly, monthly, etc)? Thank you! I think I read that a customer cannot choose what day their reoccurring subscription payment is paid. I feel like I misunderstood since that seems like an important feature. Can they choose the day of the month if the subscription is set up monthly, or will it just come out every 30 days from the date they initially set it up (which seems like a poor design)? Thanks for sharing these steps about Recurring Payment Option. I currently have Payolee that allows you to accept recurring payments on your website. It looks like Paypal Pro integration is asking for API username, password and Sugnature. But paypal pro now uses payflow which operates differently and you use paypal manager credentials to access the payflow gateway. 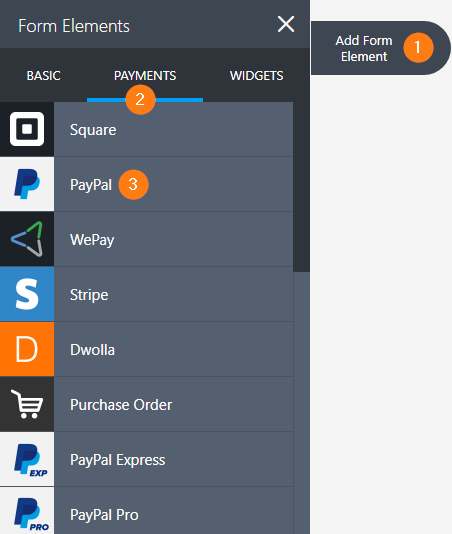 Is there any way to integrate with paypal pro now that it's on payflow? I used to have an "unsubscribe" button on the bottom of the of the form. What happened to it? How do I put it back on? It would appear that on the new paypal wizard that the option to limit the number of payments has disappeared? How can I now set this up? On previous forms that I set up is the number of payments limit still set up? Can i pick the date the recurring payment is charged? I would like the recurring payment to come out on the 5th of each month? We set up a recurring payment option with Paypal Pro where users enter in their own amount - everything works great, except reporting. On the form submission and email confirmation, the amount the user entered in does not show up. How do we get this to show up? How can i set up recurring payments ? I want to give a option so people can pay the same amount each month for only three months. Also I tried to choose the option to set up recurring subscriptions with stripe but it mentioned to set the API key and not sure what that means to actually do? I would like to know if it is possible to cancel a subscription by myself. For example, my client at first choose to pay me services in several times, but in the middle of his subscription, he wants to pay his balance in one shoot. Is it possible to stop it or not ? I want to charge $1 up front during the trial period and then $99 after 1 month... but it won't let me. Is there any way to make this work without having the customer to enter a coupon? - radio buttons with several donation levels, and one that allows them to put in their own amount. - then a checkbox below that saying 'recurring donation' which then presents them with options for monthly, yearly, etc. So it's all one donation process with the user selecting their preferences as they go. I have Paypal Payments Pro. If you set up a recurring payment at say, 2 weeks after the initial set up fee, can you go in and adjust that date manually if needed? If adjusted, the subsequent recurring payment dates would adjust also. I need to increase the monthly recurring time to "72". Is this possible? I want to give my customers a 30 day trial that is 50% off of the normal monthly price but I am not being allowed to. Is there a way that I can made the initial payment for my first 30 day trial lower than my regular monthly payments? As far as the 'Number of Payments' figure, I am a little confused. I want to set up a subscription for 13 equal payments. If I put '13' in the 'Number of Payments' box, does that mean there will be a total of 13 payments (including the initial payment) or does it mean that after the initial payment there will be 13 subsequent payments? 1. Is there a way for them to put in their own custom amount besides what shows there? 2. Is there a way to have it that there is also an option for a 1 time donation? How come I can only have one subscription price option? 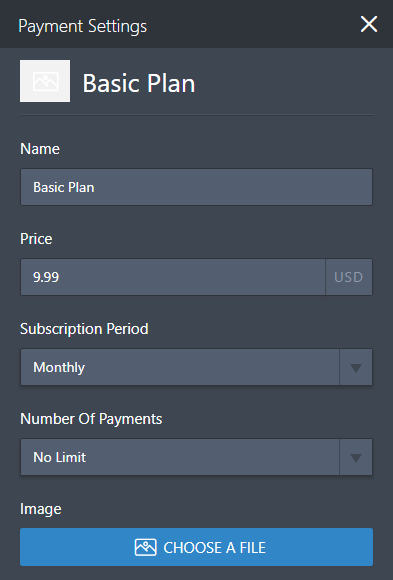 Under Subscription Details; within Subscription Wizard, my list is different then the list posted above and I am wondering why? I run the website for a rowing club where we have maybe 10 scholarship kids a year. I know you can't do discount codes (will that be something you'll set up in the future? It would help in so many ways!) so how can I have the kids register online so I can get their details in the database, but not ask them form a payment at the end of the form? Also, some kids get a full ride whereas others pay for half. Again, how can I do this online without giving everyone who signs up the option to pay in full, half or nothing? How to pass calculated total to a payment field? Will our current application form only be able to process 3 payments as we long as our account is free?